Of interest only to close observers of the career of its director, Douglas Sirk, this minor work was his first as a contract director at Universal, long before the delirious delights of Written on the Wind and others. 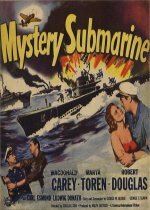 The extravagant plot has Robert Douglas's U-boat captain, who has survived the Second World War in South America along with his vessel, kidnapping a German atomic scientist and offering him for sale to a foreign power. Fortunately, Macdonald Carey's American agent has infiltrated the crew.